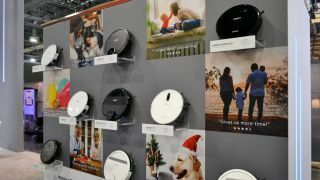 At CES 2019, robot vacuum maker Ecovacs unleashed its smartest model yet: an AI-powered bot that uses machine learning to keep your floors spotless, without accidentally sucking up articles like socks that will prove bad for its digestion. Ecovacs first showed off the concept at IFA 2018 in Berlin, but now the Deebot Ozmo 960 is ready for release into the wilderness of your home. It uses AIVI (Artificial Intelligence and Visual Interpretation) technology to create a bespoke cleaning plan, and detects objects like clothing and cables so it won't get stuck trying to devour a pair of discarded pajamas. The Deebot Ozmo 960 can currently identify around 500 objects, and the company plans to add more obstacles to the Deebot Ozmo 960's database over the coming months, so it'll become even better at avoiding everyday household hazards as time goes on. Ecovacs also used its stand at CES 2019 to show off it latest Smart Navi navigation technology, plus its Ozmo wiping technology, which treats particularly stubborn dirt with an electronically-controlled water pump and sensors. Like all of the company's cleaning bots, the Ozmo 960 can be controlled with either the Ecovacs or Ecovacs Home app, or any Google Home or Amazon Echo smart speaker, so even the laziest among us can have a cleaner floor. We look forward to testing it soon, and seeing how it compares to the best robot vacuums currently on the market.